My guest today is author Melina Morel whose newest paranormal romance title just hit bookstore shelves this week. Smolder is the third book in Melina's Institut Scientifique series which began with Devour (2007) and was followed by Prey (2008). You can read my review of Smolder here. This was a new series to me and I jumped in at the third book which I quite enjoyed. The earlier books will definitely be added to my wishlist. If you would like to win one of two copies of Smolder, check the contest guidelines at the end of the post. Melina will also send the winners signed bookmarks to go with their books. Melina will be dropping by to answer questions, so please give her a warm welcome and ask away. SFG: In Smolder, you have set the werewolves up as the adversaries. Of all the supernatural creatures, what attributes led you to portray them as the bad guys? The fact that they have really big teeth and they can chew you up in nothing flat. Everybody’s afraid of the big bad wolf. Remember what he wanted to do to Little Red Riding Hood? ‘Nuff said. Truthfully, wolves are handsome, family-minded creatures, but in the folklore, they’re bad to the bone, so for me, they make great bad guys. And the idea of a fellow human being able to turn furry on you is truly horrifying. SFG: Your vampires have a lot of the classic traits including shapeshifting. What were your influences (supernaturally speaking) in writing Smolder and the series? My ideas about vampires were probably formed while I was quite young and watching old movies on TV. Later on, before I began writing Devour, I started researching vampires in history and legend, and one of the things that surprised me was the prevalence of vampire stories around the globe. Even China, a place I never associated with vampires has some myths. The most flamboyant spots of course are the places in Eastern Europe normally associated with the species. And finally, a colleague of mine who was a fan of the paranormal was kind enough to read my first draft of Devour and let me know her take on it. She encouraged me when almost all my other colleagues were – shall I say – highly skeptical. Thank you again, Sophie! SFG: Can you tell us about your travels and research and how that meshes with the locations and background for Smolder? I’ve always been interested in European history, long before I became interested in vampires. When I was a kid, I used to read history all the time, and later on after I graduated from college and started working, I traveled to Europe about a dozen times over the years. I studied French in college, so France had a particular interest for me, and I loved my visits to Paris, so that made me decide to make my elegant werewolf huntress a Frenchwoman. Also that inspired me to create Ian Morgan – Count Jean de Montfort in the old days - an aristocrat of the Eighteenth Century who turned vampire to avenge himself on the werewolf cousin who slaughtered his wife. On top of that, I discovered that France and other European countries have a trove of werewolf lore. According to historic documents, France had a severe werewolf problem in the seventeenth and eighteenth centuries in the southwestern part of the country. Or at least the people believed they did! SFG: For readers new to the series, can you give us the highlights of Devour and Prey and how they fit into the overall story arc of the series? In Devour, I introduced Catherine Marais and Paul DuJardin, werewolf hunters from the mysterious Institut Scientifique in Geneva. The last Montfort werewolf has surfaced in Manhattan and the Institut has sworn to exterminate him. He’s on a vicious killing spree, striking fear into the hearts of New Yorkers in all five boroughs. Paul has just fallen in love with a pretty professor who’s about to translate his newest book and Catherine is deeply smitten with Ian Morgan, resident vampire and Montfort relative. As the chase leads them closer and closer to the destructive werewolf, victims fall to his fangs, his life begins to fall apart, the head of the Institut himself comes to Manhattan to oversee the takedown, and the final scene plays out in a frantic effort of “do or die.” Literally! In Prey, I took one of the minor characters from Devour – a handsome werecat – and made him the hero of my second book. Pavel Federov, Russian expat and former special ops officer, now runs a security company in Manhattan, where he’s called in to investigate a break-in at the warehouse of an antique dealer. The specialty of the house is Russian antiques and neither Vivian nor her partner and brother Marc can figure out why anybody is trying to steal from them. As Viv points out, they don’t deal in Faberge eggs. What they do have – and don’t know it – is a Russian treasure, planted in the warehouse by an evil werecat from Pavel’s clan who wants to sell it to a crooked businessman. This sparks a fight to keep the treasure from the bad guys, send it back home, and along the way, free Viv from entanglements with the leader of her own werecat clan who wants her and will kill to have her. Many alliances are formed and some shatter in the struggle – and Pavel and Viv break some serious taboos along the way. Catherine and Ian have a kind of cameo appearance in this one in a few small but important scenes. And I’m proud to say Prey won two awards in 2009 in the paranormal category: the New England Readers Choice Beanpot Award and the Maggie Award from the Georgia Romance Writers. I think all three books act like episodes in a saga, characters coming and going as needed, all telling some part of the tale. SFG: Which character was the most difficult to write? Do you have a favourite? Well, if we’re talking about all three books, I think I’d have to say Luc was the hardest to write. This is rather comical when you consider that he’s basically a nice guy, and some of the other characters I’ve created have been nasty egomaniacs with vicious streaks a mile wide – Pierre the werewolf and Bella of the Siberian werecat clan come to mind here. Bella Danilov was the arch villain of Prey. Bella is so bad she has a kind of evil allure, and her true nature is on full and groveling display when she is called to account by the werecat god of her people, Moroz the Dread, after she tries to flim-flam him! Luc has a lot to put up with since his father is the werewolf leader – the Lupus Minor – of the Ile-de-France pack. Luc’s decent nature is a foil for the evil Lupus Minor, and for him life is a struggle to remain human while suffering intense pressure to go werewolf. All he wants is to remain a human being, but the terrible genetic heritage he carries pulls him, despite his best efforts, in the other direction. The battle that generates seals the pack’s fate. So Luc was the hardest to write and I guess Bella was at least one of my favorites. After you’ve met Bella, you can never look at a Siberian cat the same way! And in reality the breed is quite sweet, loyal and affectionate, nothing at all like my character. SFG: What does the future hold for the series? What other projects are you working on? Right now, I’m working on a fourth book, and Solange and Luc from Smolder are the hero and heroine. You know, I didn’t start out to write a series. It just developed. And you’re the first person to give it a name – the Institut Scientifique series. I like that. I’ll have to tell my editor. I’m not involved in any other projects per se. Writing a book is enough to keep you busy. However, I’m going to try to attend more meetings of the NJRW this year because they’re a terrific group of writers who have a lot of good advice to give and are very supportive of their members. They also have the wonderful Put Your Heart In A Book conference in October where many leaders in the publishing industry come to speak. I attended this year and found it very informative. SFG: You have previously published some historical novels. What brought you to write paranormal/urban fantasy? How is the writing process different/similar? Would you like to combine the two? My historical novels were written a long time ago, but they’re still very dear to my heart. What happened was a long period of time that went by without selling any more of them. So my agent suggested that I try something else, something completely different, and I took her up on it. Werewolves and vampires are about as far from Europe in La Belle Époque as you can get. Also, I have to admit, it was quite a challenge because I didn’t know if I could actually compete in the genre, but I was determined to try. To my surprise, she sold Devour in just a couple of months and it was a two book deal, which nearly floored me. So now I had to write not one but two paranormals! I didn’t know whether I was stunned or delighted, but either way there was no going back. I had signed a contract and I would give it my best shot. In writing historical novels, you have to be meticulous about the facts of history. This means looking up an incredible lot of information - from the kind of lace on your heroine’s gown, to royal or imperial orders of chivalry. And much more. On top of that, you have to worry about character development and moving the story along. The research alone is formidable. With a paranormal, you have the liberty of setting it in modern times, a period quite familiar to you. Of course you still have to research some things, but living in the same time period is pretty helpful! Two years ago I wrote a short story using Ian Morgan in an 1890’s New York setting. It hasn’t been published, but I enjoyed writing it, and I sometimes think I’d like to do a novel showing Ian as Count Jean de Montfort, back in the days of the French Revolution. Who knows? SFG: What are you reading now and what is waiting for you in your “to be read” pile? Well, as I said, I like history and right now I am reading a book called The Twilight Years The Paradox of Britain Between the Wars by Richard Overy. It’s not light reading, but it’s fascinating. In my “to be read” pile, I have Noble Blood by Linda Parisi, a paranormal. And I can’t wait to read Kitty's House of Horrors, the newest addition to Carrie Vaughn’s Kitty series, due out this month. I adore her werewolves, which are quite different from mine. SFG: If you could be any of your supernatural characters, which would it be? Boy, that’s a tough one, but all things considered, I think I’d be a werecat. More like Viv than Bella, though. SFG: Who is your favourite vampire/vampire movie? Again, that’s a hard question because there are so many great ones. However, thinking of Frank Langella as Dracula and the elegant and seductive way he delivered the line, “I don’t drink – wine,” with that tiny, but provocative pause, makes me think of him as a world class vamp. And I loved Bram Stoker’s Dracula with Gary Oldham. That was a glamorous, vivid production, and it had wonderful wolfy sound effects during the Transylvanian scenes! Ah, the children of the night…. Wonderful atmosphere! I have two copies of Smolder to giveaway to some lucky commenters. Melina Morel will also forward signed bookmarks to the winners! Leave a question or comment for Melina and/or suggest an exotic location that you would like to see as a setting for a paranormal romance. Open to any destiunation the The Book Depository ships. Giveaway open until Midnight, January 13, 2009 EST. Great interview. I have to say, I personally never thought warewolves as the bad guys per se, although the more I think of it, the media does deem them the "bad guys". I really like the story you have set up but I'm very curious, how long does it normally take you to write each novel? Do you have plans to continue to release a book a year? Also, how long do you think the series will last? Wow, this sounds like an interesting book... Thanks for the tip! I haven't read any of the series but they sound interesting. I must try and find some of Melina's earlier historicals as I like that genre. For exotic locations how about Shangri La. There actually is an official town of that name on the Chinese/Tibet border and it is a big destination for Chinese tourists ! That's why I like your stories. The characters have dimension, the stories are set in places I recognize, and the plots are fast paced. That tinge of humor is a bonus too! Great interview.I have never heard of this series before,but it sounds great.I'll be adding it to my TBR list. I think I would say five or six months for the writing and a few more for all the editorial things. It has to go to the editor, then she reviews it, makes suggestions, you go back and work on those and then if she accepts it, you're ready for the next step, which is the technical part. For PREY I did my revisions online for the first time and it was a little nervewracking since I'm not a techie! I'd like to release a book a year, but that depends on the publisher's wishes! I hope the series will last through at least one more book, if not more. I'm glad you liked the post. I hope you get a chance to read SMOLDER. Shangri La? That sounds like an exotic locale for sure. Hmm. Thanks for the compliment. I try to throw in some humor along with all the vamp and werewolf business. It lightens a "dark" genre! I hope you get a chance to try one of the books from the series. I think you might enjoy them. I would suggest, if you're interested in French werewolf mythology, that you watch Le Pacte des Loups (also released under the title Brotherhood of the Wolf in North America) which is an excellent film on the topic. Based on your description of werewolves, I think you would enjoy it! (And since you took French, you might even want to watch the original version, although the translated one is also available). I just had to chime in about Christine's suggestion to view the movie Brotherhood of the Wolf. I've also seen it both an English and subtitled version. Not nearly as well known a it should be. Awesome flick! I haven't read any of your books yet but they sound really interesting. How about setting a story in Madrid? I hope you get a chance to read the books. Smolder has more of Catherine's personal life than the previous two - and trouble with a wayward teenage niece. Kids! Even werewolf hunters have off days. And Madrid sounds appealing. Do they include Brotherhood of the Wolf in those DVD catalogues you get in the mail? Or could you find it on Amazon? It really does sound interesting. Do you know the year it was released? This is an open question to anyone out there. I would love to see a paranormal book set in Singapore or Malaysia. Just mix it in with local folklore and the possibilities are endless! Melina you can see the particulars of the movie at The Internet Movie Database. It was made in 2001 so should be relatively easy to find. It may even be in your local video store. Well, as a matter of fact, I liked the idea of Paris so much that most of SMOLDER is set there - and in a fictional small town in the Paris region. Other parts are set in Strasbourg. We're on the same wave length here I think! I have never heard of this series before but it sounds interesting. For an exotic location another commented suggested Singapore or Malaysia. I think those would be great too, I don't think I have ever read a paranormal set there. Singapore or Malaysia sound like exotic spots for trouble of the paranormal kind. Only in Singapore, the werewolves had better not violate any of the strict anti-litter laws. Especially involving chewing gum! I always thought a PR in Hawaii would be great. Scary volcanoes and all that fruit! Blame it on my obsession with Lost. Your series sounds great! I'd love to see a paranormal romance set in Venice, Rome, Vienna, Hong Kong, Mumbai, or Beijing. Great interview! Melina, I just want to say that I love the title, Smolder. So simple, yet so evocative. I'd definitely be drawn to it in the bookstore even without reading the Q&A and being intrigued by the plot. No need to enter me in the contest, Doug, just wanted to say hi! Hawaii does sound like a lovely place for a paranormal romance. It has those gorgeous,lush landscapes and a scary legend about Pele the fire goddess. I can see it now: SCORCHED EARTH - ancient pagan fire goddess slays werewolves and serves them in the fire pit with pineapple! Down here, we're preparing for snow tomorrow and I just made a run to the grocery store. Hawaii sounds glorious. All those suggestions sound good. Vienna and Rome have wonderful atmosphere, lots of history and great scenery. And Mumbai has tigers just on the outskirts of the city. Weretigers! I loved your interview. Ian is my favorite character from Devour. I'm so glad that he is a character in Smolder. I'd love to read about him during the French Revolution. Thank you. One of the hardest things in writing -- for me anyway -- is coming up with a title. Sometimes they ask you for suggestions and you serve up a dozen and the editor and publisher chew them over, so to speak, and sometimes they pick one of your suggestions - and sometimes they let you know which one of theirs is going on the cover. SMOLDER was my idea. PREY was my editor's. Yes, I like Ian the vamp too. Thank you. I tried to present him as a strong presence with an ironic sense of humor as befitting his eighteenth century time period. Also, he really and truly loves Catherine. And I would like to have him as the hero of a "How He Came to be a Vampire" book. The French Revolution would be a very dark setting for his story. Great interview and a very exciting series! I would love to see a series put somewhere in Bangladesh--I don't really have a reason other then it's the most exotic locale I can think of. I haven't read any of her books, but they sound interesting. I would like the see a book set in the Philippines. What an interesting interview! Smolder sounds amazing. As for an exotic location for a book...how about the Bahamas or Hawaii. I'd write it myself, but that's difficult not having been to either place before. Now Bangladesh is an exotic idea. I haven't been there, but with all the lush vegetation and tigers, it sounds as if it could be a great setting. It would probably make a great Bollywood flick, too. Well, the Philippines have that great tropical scenery and at least one volcano, so things could get out of control real fast there. And there might be creatures of the night that Americans haven't even heard of. Sounds good. With all the lovely islands and other tropical places already mentioned, you're the first person to bring up Bermuda. My website designer just returned from a vacation there and raved about the beautiful pastel buildings and the pink beaches. It sounds heavenly. And since it's an island with lots of history, it ought to have some really nasty paranormal creatures lurking in the shadows. Or you could make them up. Great interview. Your series is new to me but sounds really good. I am going to have to add the first two to my wishlist. 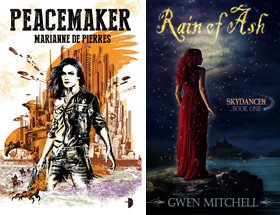 Now that you have written historicals and paranormals, any other genres do you want to try? Do you one day want to write more historicals or having too much fun right now with paranormals? Thank you. I hope you like the first two books if you try them. I established the set-up in DEVOUR and embellished it over the course of PREY and SMOLDER. In response to the question about branching out, I really do like the paranormal genre right now. There are certain parameters, but mainly it's a case of "My werewolves, my rules," and that frees you to be creative. The one thing I would like to do is write a comic paranormal. Maybe one day? 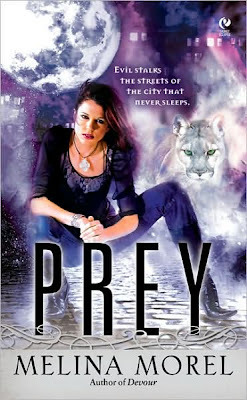 I have prey in my tbr pile and seriously need to dig it out. I would love to see a book in the outback of Australia. I don't know how exotic this place is but I love it. I think a story in Rome would be fun. I love the history behind everything and the buildings that are still standing are just amazing. There could be a big fight in a colosseum! I've read both Prey and Devour. Enjoyed t hem both. Looking forwrd to reading Smolder. they are some of exotic places that i know, and i believe we have some thousands more ! i wonder what's your favorite scenes on both books ? i really like to have the chance to win one of your books ! I hope you get a chance to read PREY. I loved writing about those werecats. And Australia sounds like an exciting place for the paranormal. I've never been there, but from what I've seen in photos and in the movies, it's spectacular. And I'd love to see a real life koala bear. Yes, Rome is a great place for a novel. Remember Dan Brown's Angels and Demons? I can picture all sorts of paranormal creatures just lurking around corners there. Werewolves hiding in catacombs? I'm glad you enjoyed the first two books. I think you'll find SMOLDER a good continuation of the saga. You get to go inside the mysterious Institut Sientifique and meet the operatives on their home turf there. And you meet Catherine's family and see a side of her that wasn't revealed in the first two. And then, of course there's the wayward teenage niece. You know, I've met people from lots of places, but never anyone from Indonesia yet.From what I've seen in photos, your homeland has to be one of the loveliest places in the world. It looks too beautiful to have bad paranormal creatures! But it would certainly be a beautiful setting for any novel. As for my favorite scenes: In DEVOUR it has to be at the end when Julie receives the package brought in by special messenger. And in PREY it's the exit from the evil leader's mansion. I hope you have a chance to read the books. I have never read any of your books but they sound very interesting and I will look for them the next time I am in the bookstore. I love coming across new books. What about Dubrovnik or someplace else in Croatia? It has so much history to it, once having belonged to the Roman Empire. My family is Croatian and I'm sure you'll find a lot of interesting things in this country's history. It's also beautiful, with the mountains and the Adriatic Coast. It draws a lot of tourists and has some famous UNESCO sites. Dubrovnik sounds delightful. I'd love to visit it some day. A place I can't wait to visit is Budapest - a friend of mine was recently there and her photos are fantastic - that seems to be a great place! Budapest sounds like a great place for a paranormal. All that eastern European folklore and a Hunnic heritage way back in the mists of time. And gorgeous scenery. It's been on my tourist "must-see" wishlist too. I've always wanted to read a paranormal/romance plot set on an uninhabited (or at least appearing to be so) island. Something along the LOST TV series, only with only one (human) character as it's scarier this way. I always think the bayous of Louisiana and New Orleans is a good setting for shifter type stories. I think South America would be an interesting place. A lot of people are retiring there. Melina, what is your muse when writing these books? I have never tried this series but it sounds really good. I will have to check it out!! As for exotic locations I would suggest maybe some little undiscovered Island!! Great interview. Smolder sounds good. How about Brazil for an exotic location to set a paranormal. I like the uninhabited island theme. Lots of areas for shapeshifters and otherworldly creatures to live and create clans. Boy does Louisiana work! Charlaine Harris uses that to perfection in her Sookie Stackhouse series. I love those books. I can't wait to see the coming season. South America could be a great spot for paranormal novels. Who knows what furred and feathered creatures lurk in those deep green jungles? Maybe some we haven't even seen yet. My muse? That's a tough one. I think about the story for a long time before sitting down to the computer. And I find it relaxing to test out plotlines in my mind when I'm out taking walks. I love that. It gives you a chance to unwind and just think about all sorts of things. i find it helpful. South America seems to be a popular choice. And why not? It's a big continent with lots of history, lots of natural resources and in Brazil, lots of precious stones. Well, in Columbia too, of course. Emeralds. Plenty of material for all kinds of stories.